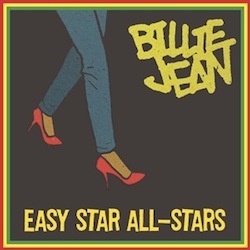 The upcoming Easy Star’ All-Stars Thrillah album is soon to come but first the band has released the Billie Jean EP today which including two tracks off the Thrillah album: “Billie Jean” featuring Luciano and “Human Nature” featuring Cas Haley. The EP also features two non-album “Billie Jean” remixes from Mister Vibes and Sounduo alongside an exclusive dub version of “Billie Jean,” mixed by the producer of the EP Michael Goldwasser, along with Joe Tomino (Dub Trio/Matisyahu). Thrillah is set for release on August 28, 2012 on Easy Star Records with a US tour to follow this Fall. The album is the reggae adaptation of the greatest selling record of all time – Michael Jackson’s Thriller. For more info and updates, please check http://easystarallstars.net often. Purchase the album on iTunes by clicking here.